St. Theophan the Recluse. Thought for every day of the year. (1 Cor 7:12-24; Mt 14:35 вЂ“ 15:11). вЂњNot that which goeth into the mouth defileth a man; but that which cometh out of the mouth, this defileth a man.вЂќ The Lord did not say this because he did not approve of fasting or because he considered fasting unnecessary вЂ“ indeed, He Himself fasted, and taught His disciples to do so, and established fasts in His Holy Church. He said this, then, not to discourage fasting. Rather, he says it to teach us that when we fast we should not limit ourselves merely to eating little and avoiding cooked foods, but should also refrain from indulging the appetites and passionate inclinations of the soul. This is, of course the most important thing. Fasting, in its turn, serves a powerful means of accomplishing this. The passions are rooted in the flesh. When the flesh is weakened through fasting, then it is as if the fortress of the passions has been undermined, and its strength crumbles. On the other hand, to overcome the passions without fasting would be as remarkable as standing in a fire without being burnt. How is it possible for one who continually indulges his flesh with food, sleep and rest to maintain any sort of attention and purpose in spiritual matters? For such a one to turn from the earth, directing his attention to invisible things and striving them, is just as difficult as it is for an enfeebled bird to rise up from the earth. (1 ???. 7, 12-24; ??. 14, 35-15, 11). “?? ? ?, ??? ?????? ? ??? ?, ?????????? ???????? ; ?? ? ?, ??? ??????? ?? ?? ?, ?????????? ????????”. ??????? ?????? ??? ?? ????? ?, ???? ?? ?? ?????????? ? ????? ??? ?????? ??? ?? ?????? ??? ?? ?, – ???, ? ??? ?? ????????, ? ????????? ?????? ??? ?, ? ? ?????? ????? ?????? ????????? ?????, ? ?????? ??? ??? ??? ?, ???? ?, ?????? ?, ?? ?? ?????????????? ????? ??????????? ??? ?????????? ?, ?? ?????????? ??? ???? ? ???? ???? ??????? ? ???? ?, ?? ???????? ?? ?????????? ? ????????? ?????????. ? ??? ???????. ???? ?? ?????? ?????????????? ???? ?????????. ?????? ???????? ? ????? ; ????? ????????? ???? ?, ????? ?????? ?????? ???????? ??? ??????? ? ???????? ?? ???????. ??? ????? ?? ??????? ??????? – ???? ?? ???? ?, ??????? ?? ? ?, ????? ???? ? ???? ? ?? ????????. ? ??? ?, ??? ???????????? ?????????? ????? ???? ???? ?, ???? ? ????? ?, ??? ????????? ????-?????? ????????? ?? ???????? ? ??????????? ?????????? ?? ????? ? ????? ? ?????????? ????????? ????? ? ?????????? ? ??? ??? ????? ?? ????? ?, ??? ??????????? ????? ????????? ?? ?????. The High priestly prayer of Jesus Christ contains not only sublime dogmas about Jesus Christ, but also a two-fold definition of salvation, and an example of how to attain it: we must care for others as Jesus Christ did. John 17:1-13These words spake Jesus, and lifted up his eyes to heaven, and said, Father, the hour is come; glorify thy Son, that thy Son also may glorify thee: 2 As thou hast given him power over all flesh, that he should give eternal life to as many as thou hast given him. 3 And this is life eternal, that they might know thee the only true God, and Jesus Christ, whom thou hast sent. 4 I have glorified thee on the earth: I have finished the work which thou gavest me to do. 5 And now, O Father, glorify thou me with thine own self with the glory which I had with thee before the world was. 6 I have manifested thy name unto the men which thou gavest me out of the world: thine they were, and thou gavest them me; and they have kept thy word. 7 Now they have known that all things whatsoever thou hast given me are of thee. 8 For I have given unto them the words which thou gavest me; and they have received them, and have known surely that I came out from thee, and they have believed that thou didst send me. 9 I pray for them: I pray not for the world, but for them which thou hast given me; for they are thine. 10 And all mine are thine, and thine are mine; and I am glorified in them. 11 And now I am no more in the world, but these are in the world, and I come to thee. Holy Father, keep through thine own name those whom thou hast given me, that they may be one, as we are. 12 While I was with them in the world, I kept them in thy name: those that thou gavest me I have kept, and none of them is lost, but the son of perdition; that the scripture might be fulfilled. 13 And now come I to thee; and these things I speak in the world, that they might have my joy fulfilled in themselves. The High Priestly prayer of Jesus Christ. Matthew 13:44-54 Again, the kingdom of heaven is like unto treasure hid in a field; the which when a man hath found, he hideth, and for joy thereof goeth and selleth all that he hath, and buyeth that field. 45 Again, the kingdom of heaven is like unto a merchant man, seeking goodly pearls: 46 Who, when he had found one pearl of great price, went and sold all that he had, and bought it. 47 Again, the kingdom of heaven is like unto a net, that was cast into the sea, and gathered of every kind: 48 Which, when it was full, they drew to shore, and sat down, and gathered the good into vessels, but cast the bad away. 49 So shall it be at the end of the world: the angels shall come forth, and sever the wicked from among the just, 50 And shall cast them into the furnace of fire: there shall be wailing and gnashing of teeth. 51 Jesus saith unto them, Have ye understood all these things? They say unto him, Yea, Lord. 52 Then said he unto them, Therefore every scribe which is instructed unto the kingdom of heaven is like unto a man that is an householder, which bringeth forth out of his treasure things new and old. 53 And it came to pass, that when Jesus had finished these parables, he departed thence. 54 And when he was come into his own country, he taught them in their synagogue, insomuch that they were astonished, and said, Whence hath this man this wisdom, and these mighty works? The following are notes about a portion of this Gospel. The parables about the Kingdom variously describe the power of the Gospel to save, the great worth of the Gospel, and the way of living that those who will attain the Kingdom must have. Each parable gives us a different piece of information. We must believe in the ability of God to save us, must value the way of the Kingdom above all else, and must live in a certain way. The parable of the field is a good example. In the parable, the field is the world. Remembering the proscription against worldliness, вЂњFor what is a man profited, if he shall gain the whole world, and lose his own soul? or what shall a man give in exchange for his soul?”, (Mat 16:26) one wonders, why would the Lord urge us to buy the world? It is because, as St John teaches, the Gospel is hidden within the world. The treasure is this Gospel. The way of life that leads to eternal life is hidden within the world; those who do not believe do not usually even see it, and when they do, it is “foolishness” to them. We fulfill the resurrection within us, by living the way of life in the world. We need the world in order to be saved. If it were not for the temptations and difficulties of the world, we would not value the treasure that is hidden within it. This is our nature; we forget easily, and become inured to Holy things, unless we continually struggle, and have temptations, and do everything possible to attain the treasure in the world. The parable of the pearl says the same thing as the parable of the field, with an important addition: there is only one truth. The size of the pearl is also of great importance. The Gospel treasure is very small (it is hidden in our heart), so those in the world cannot see it, and see that we are truly rich. St. Theophan the Recluse. Thoughts on every day of the year. (1 Cor 3:18-23; Mt 13:36-43) вЂњAnd they shall cast them (those who offend of do iniquity) into a furnace of fire: there shall be wailing and gnashing of teeth; then shall the righteous shine forth as the sun in the kingdom of their Father.вЂќ In this manner, evil and good, light and darkness will be divided. Now, during this life, they are commingled, as it was pleasing to the Lord to order things such that his creation would grow and become stronger in good through the struggle against evil. Evil is allowed to freely exist within us and to influence us from without, but it does not determine our actions. Rather, it tempts us. When tempted, we must not fall but fight. Gaining the victory, we are freed from one temptation, and move onward and upward to meet a new temptation, and thus it is until the end of our life. O, when will we understand the meaning of the evil which tempts us, so as to order our life in accordance with this understanding! Those who struggle are crowned, and in the end, pass on to another life, where there is no sorrow or sickness externally, and where internally, like GodвЂ™s angels, they will be pure, without the defilement of tempting movements and thoughts. Thus we may be prepared for the festival of light and good, which will be revealed in all its glory in the last day of the world. ????????? ?????? ?????????. ????? ?? ?????? ???? ????. (1 ???. ?, 18-23; ??. 13, 36-43). “? ???????? ? ?” (???????? ???????? ? ??????????) “? ???? ???????? ; ??? ????? ???? ? ??????? ????? ; ????? ?????????? ??????? ?, ??? ??????, ? ??????? ???? ??”. ??? ?????????? ?????????? ????? ? ?? ?, ????? ? ????. ?????? ????? ?????? ???????? ??. ??????? ?????? ???? ??? ??????? ?, ????? ??????? ??????? ?????????? ? ?????? ? ????? ????? ?????? ?? ???? ; ??? ???????? ? ? ?????????????? ? ???????? ????? ?, ? ? ??????????????? ? ????????? ?? ???. ??? ?? ??????????, ? ????????. ???????????? ????????? ?????????? ?? ??????, ? ???????? ? ??????. ??????????? ???????????? ?? ?????? ?????????, ? ??????????? ?????? ? ???? ?, ????? ??? ???????? ? ????? ?????????. ??? ?? ?????? ????? ?????. ?, ????? ?? ????????? ??? ??? ???????? ??????????? ??? ?? ?, ????? ?? ????? ?????????? ???????? ? ????? ????! ????? ??????????? ?, ?????? ?, ???????? ? ?????? ???? ?, ??? ??? ?? ??????? ? ???????? ?? ???, ? ??? ??? ??????? ?, ??? ?????? ???? ?, ?????????? ??????? ??? ?????????? ????????????? ???????? ? ??????. ??? ????????????? ????????? ????? ? ???? ?, ??????? ?? ???? ????? ????? ????????? ? ????????? ???? ????. Why speakest Thou in parables? But Our Lord gives us hope, saying, “therefore speak I to them in parables: because they seeing see not; and hearing they hear not, neither do they understand.” In other words, as Archbishop Averky of Syracuse explains, the parables make divine truths accessible to our earthly minds. If we attend to the LordвЂ™s parables and attempt to live according to their teaching, then we will come nearer to the Lord and be enlightened by His grace. Gradually, then, we will grow closer to heaven, and will be able to understand the more sublime teachings of the Lord, and will find ourselves amid the guests at the heavenly banquet. Glory to our God! St Nicholas is building a new temple! I know many of you personally, and some only by email or the phone. Many of you know me, and I am always amazed and gratified when I travel to encounter people who thank me for our web ministry. http://www.orthodox.net is over 10 years old, and has reached literally over several million people (we have over 100,000 viewers a month). Our blog is slowly becoming more popular too. I treasure the good will and friendships that my web presence has garnered. I have been privileged to hear some amazing stories and help missions from afar with our materials. I am also quite sure that our web presence has been a significant part of the conversion to the true faith of more than a few, and helped direct many to Orthodox churches all over the world. I am writing you today to attempt to trade a little bit on this good will. We are a small and growing parish, at a critical time. We are about to build a new church on a beautiful piece of ground. We are a little bit short of the projected cost. At this point, we think we need to raise $20,000 dollars before we finish building in the Fall. I am appealing to you, if your heart so leads, to help us in any way you think is right. Of course, we could use donations, but low or no interest loans, or being put in contact with a potential benefactor is helpful too. The last part of this appeal is the content our building fund page – “http://www.orthodox.net/aboutus/building-fund.html. May God bless you and help you in all things. Would you like to be the benefactor of an Orthodox temple? Every additional $130 in our building fund pays for a sq. ft. of our 1700 sq. ft. temple & hall which we plan to worship in by late Fall, 2008. We are an active Russian Orthodox Christian community. Our Sunday services are in English with many hymns repeated in Slavonic. We have outreaches to the community in the form of prison ministry, nursing home visitations, and a very full liturgical and teaching schedule. We are the only church in the Metroplex which follows the same calendar used in Russia and regularly includes Slavonic and English in our services and homilies. We have purchased land in McKinney Texas, and are building a 1700 sq. ft. chapel with small hall, to be completed in late Fall, 2008. We have a two phase building plan. We plan to build our chapel, with a small hall affixed, for services in the Fall, 2008. The chapel will look like a “real church”, with two cupolas, and it will be our worshipping home as we grow and get ready for phase two, which is to build our permanent temple on the same grounds; the chapel will be converted to a church hall with offices. The chapel will cost about $221,000 to build (about $130 per sq. ft., with a 120,000 loan at 7%, paid off in ten years). We are seeking benefactors to “donate a sq. ft.”, or a part thereof. We have set up an account to receive tax-free donations. We will be happy to send you a receipt, and to pray for you and your family as benefactors if you desire. You may also send checks, made out to “St Nicholas Orthodox Church Building Fund”, to our treasurer, Reader Nicholas Park, 1.316 Corporate Dr. Lewisville, TX 75067. Email Fr Seraphim, with a list of your immediate family members, so we can begin commemorating you in the Divine Liturgy. McKinney Texas is the fastest growing city in Texas, with a current population of over 100,000. City projections are a population of over 300,000 by 2020. We will be the only Orthodox Church in McKinney; the closest sister church, in Plano, will be about 20 minutes away by car (on a good day!). 5th Sun after Pentecost 2008, Every occurence in our life is a meeting with Christ. Every occurence in our life is a meeting with Christ. Matthew 8:28-9:1 And when he was come to the other side into the country of the Gergesenes, there met him two possessed with devils, coming out of the tombs, exceeding fierce, so that no man might pass by that way. 29 And, behold, they cried out, saying, What have we to do with thee, Jesus, thou Son of God? art thou come hither to torment us before the time? 30 And there was a good way off from them an herd of many swine feeding. 31 So the devils besought him, saying, If thou cast us out, suffer us to go away into the herd of swine. 32 And he said unto them, Go. And when they were come out, they went into the herd of swine: and, behold, the whole herd of swine ran violently down a steep place into the sea, and perished in the waters. 33 And they that kept them fled, and went their ways into the city, and told every thing, and what was befallen to the possessed of the devils. 34 And, behold, the whole city came out to meet Jesus: and when they saw him, they besought him that he would depart out of their coasts. 1 And he entered into a ship, and passed over, and came into his own city. Holy Royal Martyrs Of Russia 07/04/08 How were the martyrs "called according to his purpose"? How are we? The reading from Romans describes in perfect detail the attributes of the martyrs. They and we are all “called according to His purpose”, and whether we be martyrs or not, it is the same exact purpose, which the Apostle describes clearly. Rom 8:28-39 And we know that all things work together for good to them that love God, to them who are the called according to his purpose. (29) For whom he did foreknow, he also did predestinate to be conformed to the image of his Son, that he might be the firstborn among many brethren. (30) Moreover whom he did predestinate, them he also called: and whom he called, them he also justified: and whom he justified, them he also glorified. (31) What shall we then say to these things? If God be for us, who can be against us? (32) He that spared not his own Son, but delivered him up for us all, how shall he not with him also freely give us all things? (33) Who shall lay any thing to the charge of God’s elect? It is God that justifieth. (34) Who is he that condemneth? It is Christ that died, yea rather, that is risen again, who is even at the right hand of God, who also maketh intercession for us. (35) Who shall separate us from the love of Christ? shall tribulation, or distress, or persecution, or famine, or nakedness, or peril, or sword? (36) As it is written, For thy sake we are killed all the day long; we are accounted as sheep for the slaughter. (37) Nay, in all these things we are more than conquerors through him that loved us. (38) For I am persuaded, that neither death, nor life, nor angels, nor principalities, nor powers, nor things present, nor things to come, (39) Nor height, nor depth, nor any other creature, shall be able to separate us from the love of God, which is in Christ Jesus our Lord. ??????? ???????????? ??????? ????????? ??????? Independent Bank in McKinney has finished processing our loan application, and the news is good, but challenging. Simply put, they will give us a loan and we will be able to build our temple, but we have to do a little extra work to make it possible. We will start building as soon as we get the loan, and will be in our new temple before the end of the year. All of the financial details are available for anybody who asks, but the gist is as follows: 1. We had asked for a loan of $150,000. The bank is willing give us a loan of $120,000. We need to make up at least part of this shortfall. We think we can make everything work if we raise $20,000. Our current cash must pay off the land, and pay for all building costs above the loan amount. We are probably about 10,000 short of having enough cash at this moment. We can scrape by with only 10,000 more, but I feel that $20,000 is a reasonable goal (see point #2), if we all work together to reach it. Therefore, we need more money, in the short term. Do you have any money laid away that you’d planned to give or loan when it was truly needed? Now is the time! Do you know anybody who might be willing to help us out with a gift or a loan towards this amount? Now is the time! Is there a family member or former parishioner with whom you are still in contact, or someone you know who likes our parish? Now is the time to contact them! 2. If everybody pays all of their pledges and we see a reasonable amount of growth over the next few years, this is all we need; we will be able to meet our obligations to the bank. I hope this will happen, but things happen in our lives sometimes, and it is possible that all of our pledges will not be paid 100%. If only 90% of pledges are paid, we will absolutely need to raise $20,000 to meet our obligations over the next four years. and the need to seek additional help wherever we can find it. 3. Our income has increased significantly since the start of 2008, and our projections based on the pledge drive show a further increase. These figures are quite encouraging, and will enable us to meet our financial obligations and complete the building project. Because a lot of this is based on projections rather than on prior year income records, the bank requires guarantors until we can give them an end-of-year report showing that we are meeting our projections. This will mean that we will likely need guarantors only until the end of 2009. “Due to the high reliance on projected cash flow, we need to have few guarantors for the loan. A guarantor is not on the actual note and the bank does not report to their credit or send correspondence to them unless there is a situation of default. If this is the case, the bank sends notice that the church is unable to pay and that the guarantors will need to step up and bring the loan/keep the loan current. “Payments monthly after the interest only period will be ~$1,078 and a group of guarantors would need to be comfortable with this number and having a total debt of $120,000 contingent on the churchвЂ™s well being. “Being a local bank, we like to have local guarantors as well and would highly prefer members of the church to be considered first. Anyone with a vested interest to make sure the church succeeds is a good candidate. Here is what all this “bank speak” boils down to. Since Independent Bank is local, they are willing to work with us. Our income in 2007 was not too good, and their figures are based on that year. They are willing to loan to us, but because our historical income was not as good as it is now, they need “guarantors” to be willing to pay off the loan if we default. Of course, we have always met ALL our obligations, and with our income rising, and great results in our pledge drive, and prospects for growth in our new area, the future is very bright. We also will actually have LOWER operation costs once we get our new temple built, because it is very energy efficient, and the total mortgage will be LESS than the amount we are paying now for our land and current location. The bank knows all this, but they have rules they need to follow. Our very conservative forecasts show that they will not require guarantors past 2009. This means that a guarantor will only be obligated until the end of 2009 – about one and a half years. They much prefer local guarantors. My family believes in this project, and will apply to be a guarantor. Who will join me? 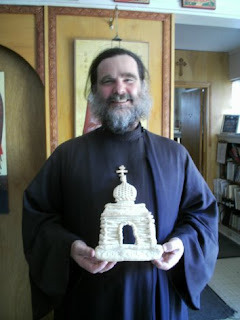 You are currently browsing the Saint Nicholas Orthodox Church blog archives for July, 2008.